macOS error "ValueError unknown locale: UTF-8"
The environment with numpy has not been activated. Another software vendor has installed MKL or Intel OpenMP (libiomp5md.dll) files into the C:\Windows\System32 folder. These files are being loaded before Anaconda's and they're not compatible. If you are not activating your environments, start with doing that. There's more info at Activating environments. If you are still stuck, you need to consider more drastic measures. Remove any MKL-related files from C:\Windows\System32. We recommend renaming them to add .bak to the filename to effectively hide them. Observe if any other software breaks. Try moving the DLL files alongside the .exe of the software that broke. If it works again, you can keep things in the moved state - Anaconda doesn't need MKL in System32, and no other software should need it either. If you identify software that is installing software here, please contact the creators of that software. Inform them that their practice of installing MKL to a global location is fragile and is breaking other people's software and wasting a lot of time. See the list of guilty parties below. Anaconda has built special patches into its builds of Python to enable this functionality. If you get your Python package from somewhere else (e.g. conda-forge), these flags may not do anything. To set variables on Windows, you may use either the CLI (Anaconda prompt, for example) or a Windows GUI. If you find others, please let us know. If you're on this list and you want to fix things, let us know. In either case, the conda issue tracker at https://github.com/conda/conda/issues is the best way to reach us. This is a broad umbrella of errors with many causes. Here are some we've seen. Conda is having problems because it can't find the OpenSSL libraries that it needs. Early installers for Anaconda put these on PATH. That was ultimately fragile because Anaconda isn't the only software on the system. If other software had similarly named executables or libraries, and came earlier on PATH, Anaconda could break. On the flip side, Anaconda could break other software if Anaconda were earlier in the PATH order and shadowed any other executables or libraries. To make this easier, we began recommending "activation" instead of modifying PATH. Activation is a tool where conda sets your PATH, and also runs any custom package scripts which are often used to set additional environment variables that are necessary for software to run (e.g. JAVA_HOME). Because activation runs only in a local terminal session (as opposed to the permanent PATH entry), it is safe to put Anaconda's PATH entries first. That means that Anaconda's libraries get higher priority when you're running Anaconda, but Anaconda doesn't interfere with other software when you're not running Anaconda. Anaconda's Python interpreter included a patch for a long time that added the (install root)/Library/bin folder to that Python's PATH. Unfortunately, this interfered with reasoning about PATH at all when using that Python interpreter. We removed that patch in Python 3.7.0, and we regret that this has caused problems for people who are not activating their environments and who otherwise do not have the proper entries on PATH. We're experimenting with approaches that will allow our executables to be less dependent on PATH and more self-aware of their needed library load paths. For now, though, the only solutions to this problem are to manage PATH properly. Our humble opinion is that activation is the easiest way to ensure that things work. See more information on activation in Activating environments. Use "Anaconda Prompt" or shells opened from Anaconda Navigator. If you use a GUI IDE and you see this error, ask the developers of your IDE to add activation for conda environments. Installing packages may produce a "connection failed" error if you do not have the certificates for a secure connection to the package repository. Conda has three similar options. The option --insecure or -k ignores certificate validation errors for all hosts. The configuration option ssl_verify can be set to False. # #   to a directory containing certificates of trusted CA. Running conda config --set ssl_verify false modifies ~/.condarc and sets the -k flag for all future conda operations performed by that user. Running conda config --help shows other configuration scope options. When using conda config, the user's conda configuration file at ~/.condarc is used by default. The flag --system will instead write to the system configuration file for all users at <CONDA_BASE_ENV>/.condarc. The flag --env will instead write to the active conda environment's configuration file at <PATH_TO_ACTIVE_CONDA_ENV>/.condarc. If --env is used and no environment is active, the user configuration file is used. The configuration option ssl_verify can be used to install new certificates. Your network administrator can give you a certificate bundle for your network's firewall. Then ssl_verify can be set to the path of that certificate authority (CA) bundle and package installation operations will complete without connection errors. The umask command determines the mask settings that control how file permissions are set for newly created files. If you have a very restrictive umask, such as 077, you get "permission denied" errors. Set a less restrictive umask before calling conda commands. Conda was intended as a user space tool, but often users need to use it in a global environment. One place this can go awry is with restrictive file permissions. Conda creates links when you install files that have to be read by others on the system. Before installing, set the umask to 007. For more information on umask, see http://en.wikipedia.org/wiki/Umask. Once you run conda with sudo, you must use sudo forever. We recommend that you NEVER run conda with sudo. If you are trying to fix conda problems without removing the current installation and you try to reinstall Miniconda or Anaconda to fix it, you get an error message that Miniconda or Anaconda is already installed and you cannot continue. Install using the --force option. Substitute the appropriate filename and version for your operating system. Be sure that you install to the same install location as your existing install so it overwrites the core conda files and does not install a duplicate in a new folder. Sometimes conda claims that a package is already installed but it does not appear to be, for example, a Python package that gives ImportError. There are several possible causes for this problem, each with its own solution. You are not in the same conda environment as your package. Make sure that you are in the same conda environment as your package. The conda info command tells you what environment is currently active---under default environment. For Python packages, you have set the PYTHONPATH or PYTHONHOME variable. These environment variables cause Python to load files from locations other than the standard ones. Conda works best when these environment variables are not set, as their typical use cases are obviated by conda environments and a common issue is that they cause Python to pick up the wrong versions or broken versions of a library. For Python packages, make sure you have not set the PYTHONPATH or PYTHONHOME variables. The command conda info -a displays the values of these environment variables. To unset these environment variables temporarily for the current terminal session, run unset PYTHONPATH. If you use bash---~/.bashrc, ~/.bash_profile, ~/.profile. If you use zsh--- ~/.zshrc` . If you use PowerShell on Windows, the file output by $PROFILE . You have site-specific directories or, for Python, you have so-called site-specific files. These are typically located in ~/.local on Linux and macOS. For a full description of the locations of site-specific packages, see PEP 370. As with PYTHONPATH, Python may try importing packages from this directory, which can cause issues. For Python packages, remove site-specific directories and site-specific files. These act similarly to PYTHONPATH for Python. If they are set, they can cause libraries to be loaded from locations other than the conda environment. Conda environments obviate most use cases for these variables. The command conda info -a shows what these are set to. Occasionally, an installed package becomes corrupted. Conda works by unpacking the packages in the pkgs directory and then hard-linking them to the environment. Sometimes these get corrupted, breaking all environments that use them, and also any additional environments, since the same files are hard-linked each time. Run the command conda install -f to unarchive the package again and relink it. It also does an md5 verification on the package. Usually if this is different, it is because your channels have changed and there is a different package with the same name, version, and build number. This breaks the links to any other environments that already had this package installed, so you have to reinstall it there, too. It also means that running conda install -f a lot can use up a lot of disk space if you have a lot of environments. The -f flag to conda install (--force) implies --no-deps, so conda install -f package does not reinstall any of the dependencies of package. The local version of conda needs updating. Force reinstall conda. A useful way to work off the development version of conda is to run python setup.py develop on a checkout of the conda git repository. However, if you are not regularly running git pull, it is a good idea to un-develop, as you will otherwise not get any regular updates to conda. The normal way to do this is to run python setup.py develop -u. However, this command does not replace the conda script itself. With other packages, this is not an issue, as you can just reinstall them with conda, but conda cannot be used if conda is installed. The fix is to use the ./bin/conda executable in the conda git repository to force reinstall conda, that is, run ./bin/conda install -f conda. You can then verify with conda info that you have the latest version of conda, and not a git checkout---the version should not include any hashes. This is a bug in the macOS Terminal app that shows up only in certain locales. Locales are country-language combinations. Clear the Set locale environment variables on startup checkbox. This sets your LANG environment variable to be empty. This may cause Terminal use to incorrect settings for your locale. 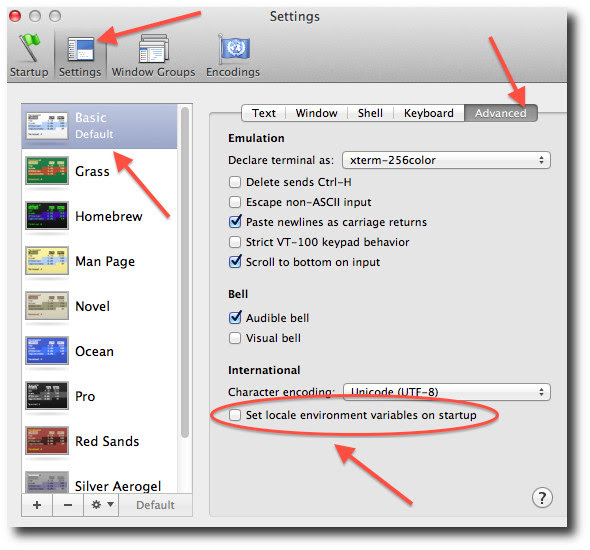 The locale command in Terminal tells you what settings are used. Replace your-lang with the correct locale specifier for your language. The command locale -a displays all the specifiers. For example, the language code for US English is en_US.UTF-8. The locale affects what translations are used when they are available and also how dates, currencies and decimals are formatted. When running a command such as conda update ipython, you may get an AttributeError: 'module' object has no attribute 'getproxies'. This can be caused by an old version of requests or by having the PYTHONPATH environment variable set. Run conda info -a to show the requests version and various environment variables such as PYTHONPATH. Update the requests version with pip install -U requests. On Windows, clear it the environment variable settings. On macOS and Linux, clear it by removing it from the bash profile and restarting the shell. When you run a command within a conda environment, conda does not access the correct package executable. In both bash and zsh, when you enter a command, the shell searches the paths in PATH one by one until it finds the command. The shell then caches the location, which is called hashing in shell terminology. When you run command again, the shell does not have to search the PATH again. The problem is that before you installed the program, you ran a command which loaded and hashed another version of that program in some other location on the PATH, such as /usr/bin. Then you installed the program using conda install, but the shell still had the old instance hashed. Reactivate the environment or run hash -r (in bash) or rehash (in zsh). When you run source activate, conda automatically runs hash -r in bash and rehash in zsh to clear the hashed commands, so conda finds things in the new path on the PATH. But there is no way to do this when conda install is run because the command must be run inside the shell itself, meaning either you have to run the command yourself or use source a file that contains the command. You activate an environment or use the root environment, and then run a command from somewhere else. Then you conda install a program, and then try to run the program again without running activate or deactivate. The command type command_name always tells you exactly what is being run. This is better than which command_name, which ignores hashed commands and searches the PATH directly. The hash is reset by source activate, or by hash -r in bash or rehash in zsh. After installing Anaconda or Miniconda, programs that run python switch from invoking the system Python to invoking the Python in the root conda environment. If these programs rely on the system Python to have certain configurations or dependencies that are not in the root conda environment Python, the programs may crash. For example, some users of the Cinnamon desktop environment on Linux Mint have reported these crashes. Edit your .bash_profile and .bashrc files so that the conda binary directory, such as ~/miniconda3/bin, is no longer added to the PATH environment variable. You can still run conda activate and deactivate by using their full path names, such as ~/miniconda3/bin/conda. You may also create a folder with symbolic links to conda, activate and deactivate, and then edit your .bash_profile or .bashrc file to add this folder to your PATH. If you do this, running python will invoke the system Python, but running conda commands, source activate MyEnv, source activate root, or source deactivate will work normally. After running source activate to activate any environment, including after running source activate root, running python will invoke the Python in the active conda environment. Some conda package installation specifications are impossible to satisfy. For example, conda create -n tmp python=3 wxpython=3 produces an "Unsatisfiable Specifications" error because wxPython 3 depends on Python 2.7, so the specification to install Python 3 conflicts with the specification to install wxPython 3. Use "conda info <package>" to see the dependencies for each package. This indicates that the specification to install wxpython 3 depends on installing Python 2.7, which conflicts with the specification to install python 3. Sometimes it is necessary to install a specific version from a specific channel because that version is not available from the default channel. The following example describes the problem in detail and its solution. 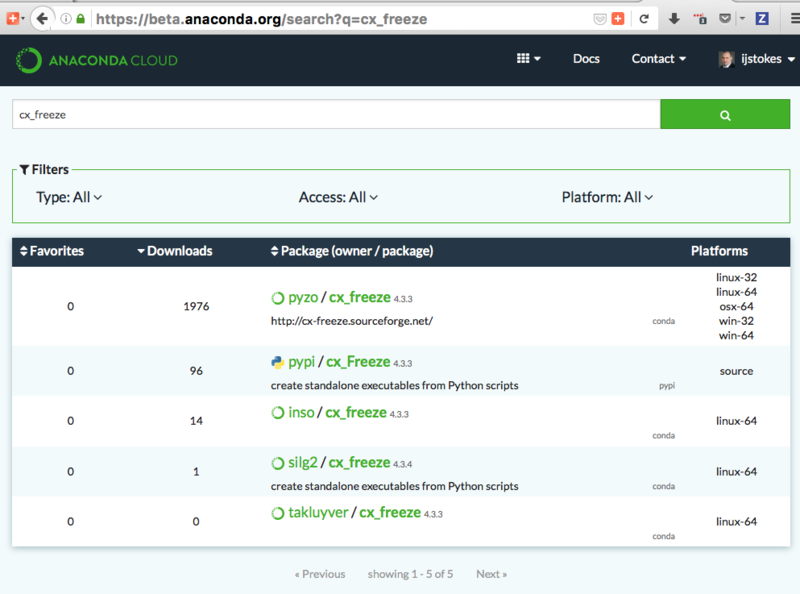 Now you have a software environment sandbox created with Python 3.4 and cx_freeze. When making a python package for an app, you create an environment for the app from a file req.txt that sets a certain version, such as python=2.7.9. However, when you conda install your package, it automatically upgrades to a later version, such as 2.7.10. If you make a conda package for the app using conda build, you can set dependencies with specific version numbers. The requirements lines that say - python could be - python ==2.7.9 instead. It is important to have 1 space before the == operator and no space after. Exercise caution when coding version requirements. CondaUpgradeError: This environment has previously been operated on by a conda version that's newer than the conda currently being used. A newer version of conda is required. Change the .condarc file. Set the parameter by editing the .condarc file directly: allow_conda_downgrades: true in conda version 4.5.12. This will then let you upgrade. If you have something older than 4.5.12, install conda 4.6.1 again from the package cache. EXAMPLE: If my conda info says package cache : /opt/conda/pkgs and my Python version is 3.7, then on the command line, type conda install /opt/conda/pkgs/conda-4.6.1-py37_0.tar.bz2 to resolve the issue. This happens when certain packages are installed with conda 4.3.28, and then conda is downgraded to 4.3.27 or earlier. Python 2 is incapable of handling unicode properly, especially on Windows. In this case, if any character in your PATH env. var contains anything that is not ASCII then you see this exception. Remove all non-ASCII from PATH or switch to Python 3.